Motivated by far-reaching upheaval in the political and social landscape, more female contenders than ever are seeking state offices in 2018. First they marched, then they ran. A historic number of women are running for office this year, many spurred by the election of Donald Trump, inspired by the Women’s March and invigorated by the #metoo movement that is resculpting the social landscape. “I’ve never seen anything like this in my lifetime,” said Maine Sen. Rebecca Millett, D-Cape Elizabeth. More than double the number of women are running for Congress in 2018 than in the 2016 cycle. Emily’s List, which trains and supports pro-choice Democratic women candidates, saw a huge spike in calls right after the Trump election. Since then, 26,000 women have contacted Emily’s List about running – up from 920 women who reached out after the 2014 election. In Maine, Emerge Maine has seen interest double in its training programs for Democratic women candidates, and it added a new “boot camp” three-day intensive program last fall specifically for 2018 candidates – many of whom are running for the first-time. We’ve been here before, in 1992. That was the “The Year of the Woman,” when a record number of women were elected to Congress. And despite a steady stream since then, today the “Year of the Woman” is seen as more of a “moment” than the beginning of lasting change. “The Year of the Woman didn’t sustain itself. This feels different,” said U.S. Rep. Chellie Pingree, a Democrat from North Haven and the first woman to hold Maine’s 1st District seat. “You’ve got a president who every day is reinforcing a lot of women’s feelings that (they’ve) got to take this seriously,” she said. “Women are shocked to be in an era where politically and policy-wise, things seem to be going backwards – employment law, education, abortion, birth control: battles that older women thought they had fought in the ’70s,” she said. “These policies a very conservative Congress has been pushing are not in sync with the American public or the Maine voter,” Pingree said. That has women like Anne Gass of Gray – a grant writer and author of a book on her suffragette great-grandmother – entering the political arena for the first time. “Some of the rhetoric in the campaign was very anti-woman, I thought. I was concerned about women’s reproductive rights. ‘What can I do about this?’ I asked myself,” Gass said. For Anne Carney of Cape Elizabeth, it was a call from her distraught 28-year-old daughter the morning after the results came in. And it’s not just Democrats. Republican Allyson Cavaretta, a third-generation business owner in Maine, said the time just seemed right for her, even if she wasn’t directly inspired to run because of Trump. “I think in general, women are feeling more empowered to run and volunteer around campaigns and civic engagement,” said Cavaretta, who is a candidate for the House District 3 seat, now held by Democrat Lydia Blume. Cavaretta and others say they were urged to run by Rep. Ellie Espling, R-New Gloucester, who five years ago co-founded She Leads – a Republican counterpart to Emerge Maine – to support Republican women with training and support. Today’s first-time candidates aren’t held back by old ideas that they “aren’t ready yet,” recruiters and analysts say. “…Hillary Clinton was so high-profile, even if you weren’t necessarily a fan of hers, seeing a woman in that role really did shape women’s perceptions of what a president can look like,” said Sarah Skillin Woodard, executive director of Emerge Maine. The state also has more women elected to the State House. Nationwide, Maine is ranked seventh in the nation for having the most women in the state legislature, according to the Center for American Women and Politics at Rutgers. 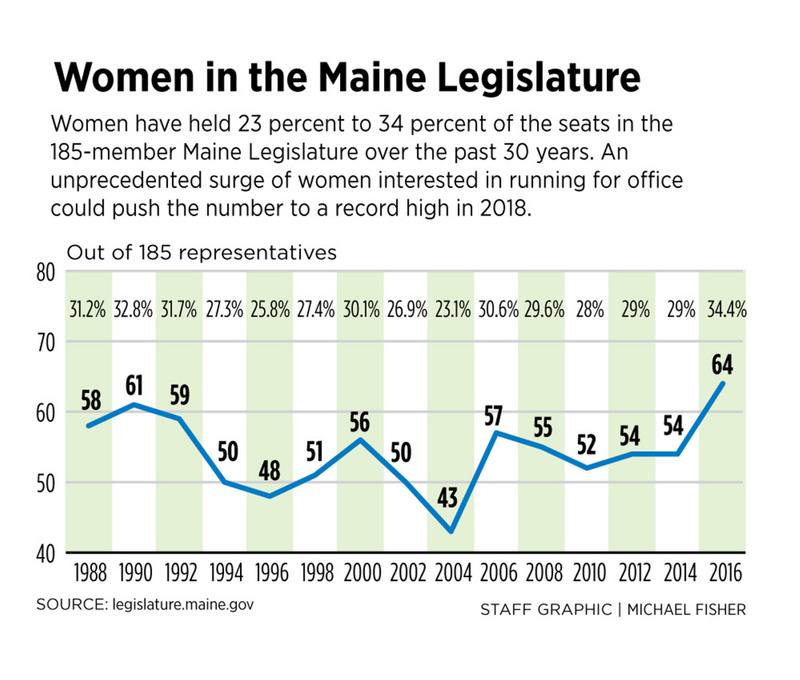 The proportion of women in the Maine Legislature is 34 percent, compared to 25 percent average nationwide. Part of that is because of the work done by party training for both Democrats and Republicans. Having those resources makes a big difference. Espling, now the assistant minority leader of the Maine House of Representatives, co-founded She Leads about five years ago to fill a need. There was “absolutely no focus on running women in the Republican Party,” she said. Experts say Maine is a good place for a woman to run for office for several reasons. Aside from having strong role models, many of the traditional barriers that held women back from entering politics – a sense that it would take up too much time, difficulty raising funds or tapping into an existing male-dominated political network – are lower than in other states, experts say. As a state of small towns, Maine voters also know their candidates personally. Women frequently hold local offices, such as town clerk or select board, and locals get to know them in those roles and see them in positions of authority. The Legislature is a part-time citizens’ assembly, which can make it easier for a woman concerned about shortchanging other aspects of her life. The state also has a history of electing independents, noted one activist. Fundraising and tapping into a political network aren’t as daunting in Maine because the state doesn’t have a strong political party system, which can narrow the field for the primaries. The Clean Election system for publicly financing campaigns can make it easier to run because candidates don’t have to raise as much money. …This year the crowded gubernatorial field includes women in executive positions – Republican Mary Mayhew, the former head of the Maine Department of Health and Human Services; Maine Attorney General Janet Mills, a Democrat; and State Treasurer Teresea Hayes, unenrolled. Women walk a careful line when describing what makes a female politician different. None of them wants to be pigeonholed as running just because she is a woman, or because they will only care about so-called “women’s issues.” The phrase itself is challenged today. The argument is that while there are issues such as reproductive rights that directly affect women, all issues – the economy, foreign policy, the military – are women’s issues. But women do tend to have a different style of leadership, no matter their political party. Snowe was the first woman to serve in both houses of a state legislature and both houses of Congress. She served 16 years in the House, plus three six-year Senate terms. Being a woman, particularly at the time when there were not many women in Congress, made a difference, she said. …”It’s not enough to have just a few women either,” Millett said. “If you are two women in a room of 20 men, you could get overshadowed pretty quickly. If you are half (women), you have equal heft and you can make a difference,” Millett said. Women voters flexed their power at the voting booth in December in Alabama, leading to Democrat Doug Jones’ victory in a Senate special election over Roy Moore. In November, a “blue wave” driven by engaged women flipped 15 seats and helped Democrats come just one vote from taking control of the Virginia House of Delegates for the first time since 2000 – and elected the nation’s first transgender candidate and several minority candidates.